Well this weekend was quite a blur. We started Saturday with cleaning house we then went to a pool party and social gathering. After that we were slated to go ride in a friends plane. The weather quickly put our plans on hold until Sunday. Sunday we attended church and then went for some airplane rides. Most of the family enjoyed the rides very much. The plane was a two seater sport plane. I loved it! I hadn’t had anytime to detect up until Sunday evening. The two youngest boys and I went to a home in town where we dug clad and a couple wheats. It amazes me that kids enjoy digging a memorial cent as much as anything else. I had one kid with the lesche in hand and another with the propointer. It was blissful! Monday morning I found myself with about 30 minutes before work. I stopped and detected some empty lots that are within a block or two of work. I dug a couple memorials and then I got a sweet signal that was in a deeper level of stuff. The Ace 250 was registering the item at 8″ and pinpointed at 6″. I dug down and pinpointed my target still in the bottom of the hole. 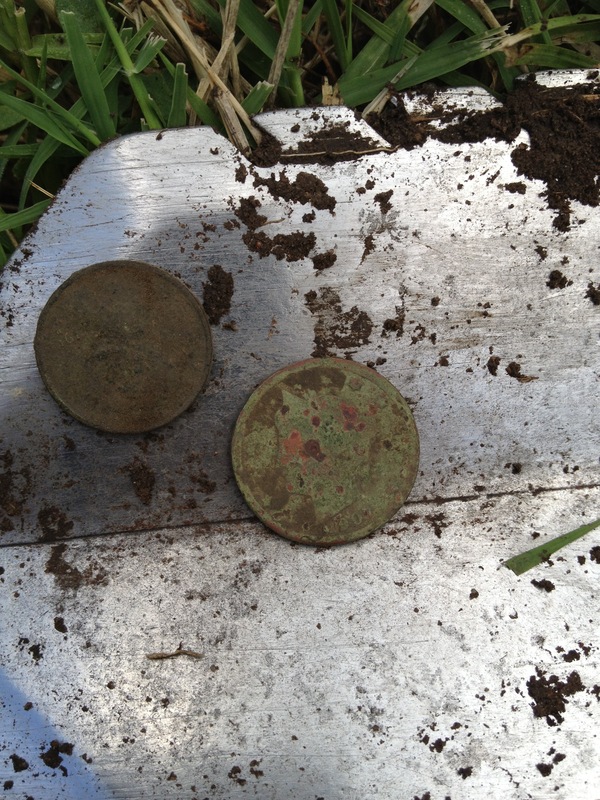 I took a little more soil out and quickly spotted two round discs. I was a little baffled at first because the size threw me off. I could tell that one was a penny and the other was slightly bigger. It wasn’t until I saw lady liberty that I knew what the larger coin was. It was my first dug V-nickel. Once I noticed that it was a 1907 I got excited thinking that the penny could be an Indian. In the end it was a 1913 D wheat cent. I believe the V- nickel is so corrode because it was stacked in with the wheat. I have to think these finds were rewards for having my family priorities in check over the weekend! Well, this weekend was the first time in almost 11 years that my wife and I didn’t have the responsibility of children. All three Ukena boys spent the weekend with their grandmother. Queen Ukena and I had been planning this weekend for awhile. We started out with a bike ride in Wichita. We spent several hours driving through Delano, College Hill, and Downtown. We managed to ride for right at 10 miles. To my surprise I wasn’t totally dead today. I think this was due to several stops at shops, fountains, and just resting whenever we felt like resting. When we went to pick up all three boys I decided to be brave and ride my bike home. It was 14 miles I thought I could shave some mileage and traffic interference by taking some good old country dirt roads. This plan wouldn’t have been bad except for the fact that it had been raining all morning. It was a little sloppy, wet, and very tough riding. I did manage to make it with only a few rests. While I was riding I received a text message from another member of Wheat State Treasure Hunters asking if I was detecting. I told him of my goal to get back to Rose Hill and his response was “Brave”. When I read his response my mind automatically told me I wasn’t brave but rather crazy.. Once I got home and rested up I met up with my buddy and we metal detected at my favorite rural church for a little while. The old church was being tight and didn’t give up any old coins. Our hunt ended when it started raining. I am very thankful for the rain though. I already have a game plan in my mind for a morning hunt tomorrow. I have a spot in my favorite morning hunt spot that I have been cleaning out all the shallow trash. Hopefully I will hit the layer in the morning that holds the good stuff! Well as I mentioned yesterday today we met with the City of Wichita. PulltabMiner and I met for our meeting at 3:30. We were quickly greeted by two executives and an intern. We sat down in a big conference room and started talking. We discussed who we are and what our goals were. 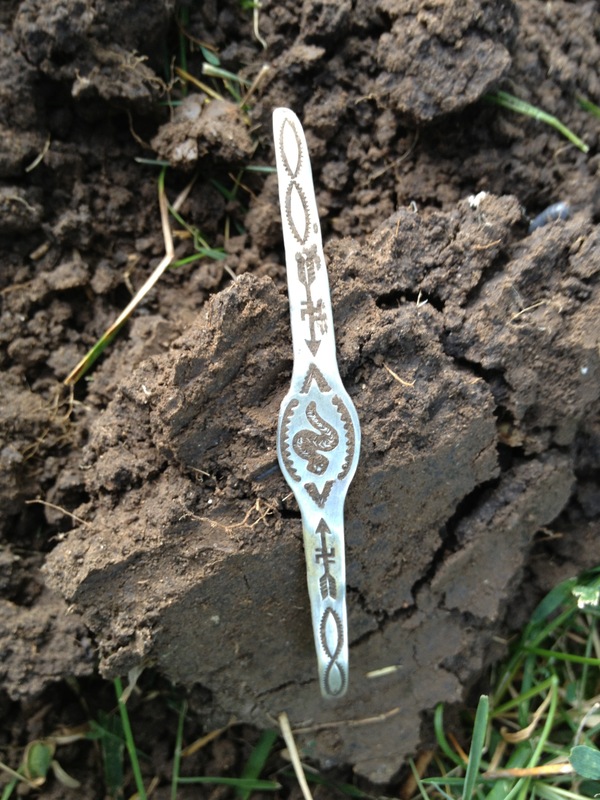 We quickly learned that the parks and recreation division manager had some history with metal detecting. She had done some land and water detecting. She had also worked in a city that had put a permit into effect. We all agreed that this was not the way we wanted the hobby to be in Wichita. We continued the conversation and got into details. Miner and I are pretty certain we will agree to the following terms. I think this is a huge step to preserving our hobby in the Wichita area. What will Wheat State do? 1: As a club we will adopt a park to pick up trash in 2-4 times a year. 2: We will perform a few classes throughout the year about our hobby. These will include laws, machine types, basic use, research, and ethics. 1: The city will give us a reserved shelter to meet in. We will provide a schedule to them of which parks we want to use and when. 2: They will publish our classes in their activity guides that are distributed to residents. These guides give residents many classes to choose from that cover all kinds of hobbies/activities around the city. 3: The city will help us out with local resources and experts on topics such as the best way to dig holes without killing sod etc. Miner and I have wanted such a person since before our first meeting. We think we are doing it the best way possible, but are we? The end of the meeting came with all parties excited to partner up and work together. I personally hope this relationship lasts for along time and helps many people understand the silly hobby we are hopelessly addicted to. Early morning silver and a big day coming up! Well now that I teased you by putting silver in the title I want to talk about the second part of the title. It’s the more important part of this post! Tomorrow is the day that we go represent Wheat State Treasure Hunters in a meeting with the City of Wichita Parks and Recreation Department. In this meeting we will find out more details about working with them in educating newcomers to the hobby about the ethics and laws regarding our hobby. I am excited to see the details and hopefully come to an agreement that works well for everyone! I am also hopeful that this will lead to other clubs and cities working together to ensure our hobby stays alive and well! This morning I stopped by my favorite morning hunt park. I detected around for about 45 minutes. 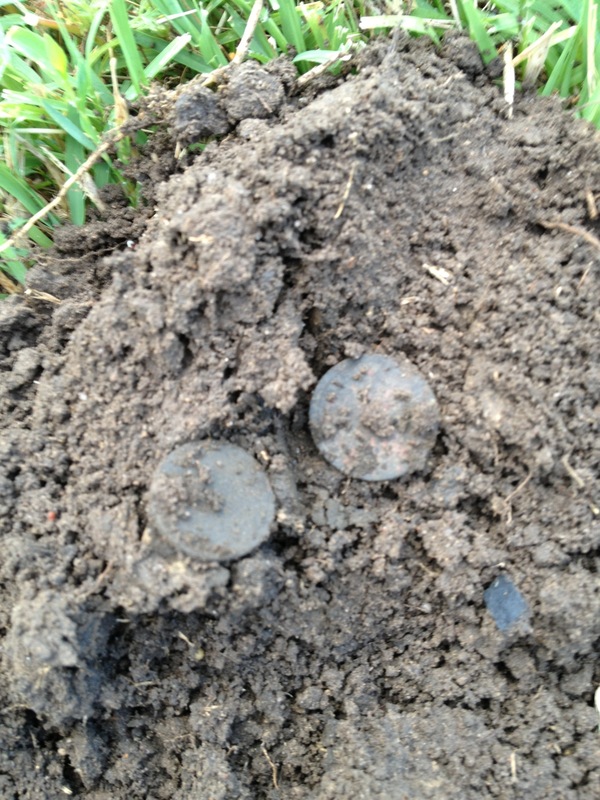 I was digging plenty o pulltabs and bottlecaps when I got a pretty sweet dime signal that had some iron drop off. This is a pretty classic bottlecap signal. I decided to dig it. At 4″ I found a large corroded nail. Then I saw a glimpse of shine. It was the end of a solid silver bracelet. It has no markings but it will melt just fine. Well the last few days have been exciting. This isn’t due to super finds but for other things. Sunday I attended the monthly Wheat State Treasure Hunters meeting. There were many new faces in attendance. It amazes me how many people we have in the Wichita area that detect. The other thing that intrigues me is how many people rely on older machines to find the goods. While at the meeting I noticed several people using detectors that are as old as I am. They know their machines and what the machines are telling them. I have said it many times that technology in detectors is great but means nothing if you don’t know how to use it. I haven’t been hunting much because of the heat and dry conditions. I did manage to dig many pulltabs at my favorite morning park yesterday in my attempts at finding gold. Last night I went to a new to me site and didn’t find a single coin. 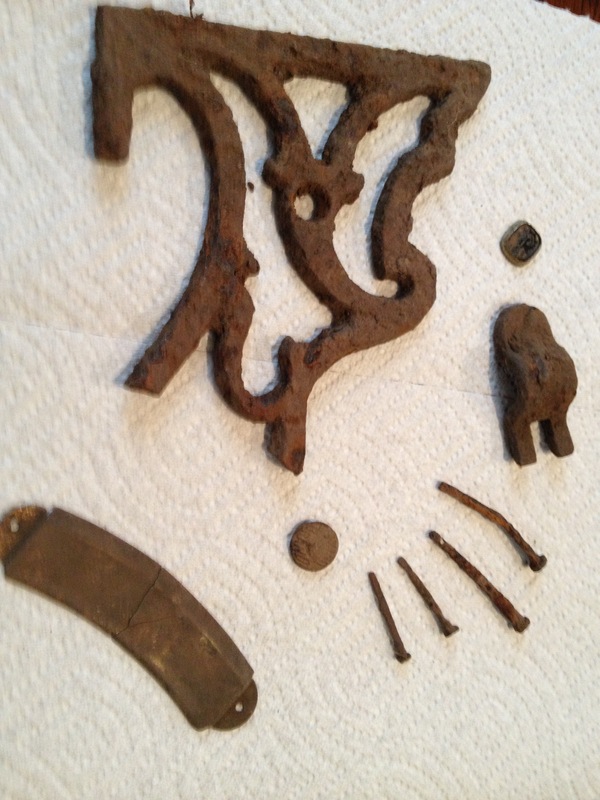 I did find some interesting artifacts including square nails and an old WM Rogers butter knife that is silver plate. I’m trying to pin down a date which is tough due to the fact there are so many designs that are similar. Hopefully we will get some rain so I can actually dig in the local clay and retrieve some of the deeper signals at the site. The fact that square nails were found makes me optimistic that I’m in the right area.